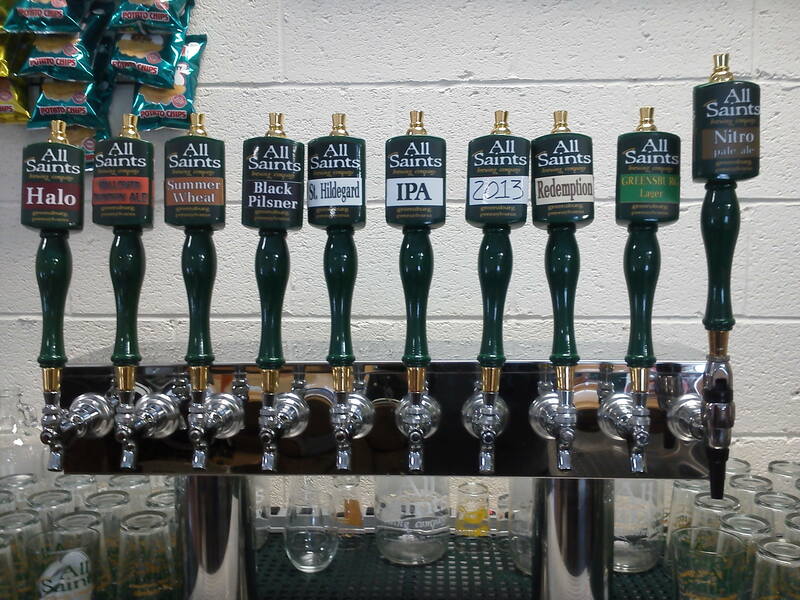 Our Taproom features 8-10 of our freshest craft brews available. Come have a taste or enjoy a pint of our main brand and seasonal specialties. The Taproom also offers beer for take away in growlers. Our entire Brewhouse can be seen just outside the Taproom, and our patio is accessible from the Taproom. Please stop by, say hello and grab a pint to enjoy with us, or grab a growler or crowler to go. Description: This is an American Pale Ale that has been nitrogenated, making it real smooth and creamy. We brewed a traditional American Pale Ale, nice and malty with a dry hoppy finish. Then, instead of carbonating it, we forced nitrogen into the beer (like a traditional stout). Because the nitrogen in the atmosphere is so concentrated, the nitrogen bubbles in the poured beer have no place to escape, and are forced by laws of nature to remain in the beer. The result is a beer that is malty, has a dry hoppy finish, holds a thick creamy head, and is real smooth and creamy. This beer cannot be put into growlers and must be consumed on premise. It is also available at our Local Saint Bella Luna, cheers! 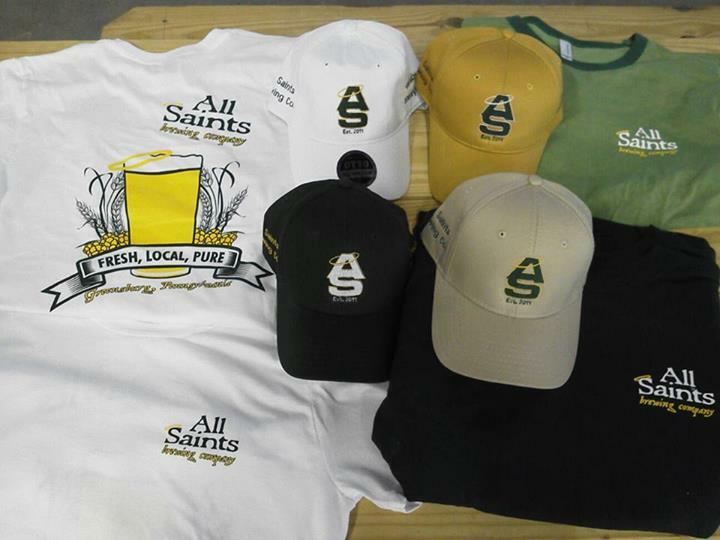 Description: All Saints first production beer. This Amber Ale was crafted to balance the hop profile with a toasty, sweet malt character, in both flavor and aroma. It has a nice medium body and a gentle, well balanced finish. Description: A light and refreshing beer modeled in the style of the American Pilsner. In the beginning, just after prohibition, this style emerged quenching the thirst of a population longing for refreshment. More remarkable than its bright gold appearance is the brew’s balance in both flavor and aroma. A beer so balanced, neither hops nor malt is detectable. So not quite the Genesis of beer, but a later emergent defining the style of a Country for decades. History: In the 1700’s, Troops and British citizens living in India as part of the colonial rule did not have access to good British ale and any attempts to ship the malt British ales to them resulted in spoilage. India Pale Ale, or IPA, was the solution. The generous amount of hops and alcohol in this brew protected it from the heat and motion of the British sailing ships of the day and could make it all the way to India without spoiling. Description: This Enlgish Style IPA offers a smooth hop bitterness with a deep and rich malt flavor. The hop aroma is delicately veiled within its huge malt profile. Available when season dictates, an ever-changing assortment of brews which represent historical beer references such as Oktoberfest and Winter Ales among others. Brews which reflect seasonal ingredients or appropriateness. Description: We figured if Boston can have one, so should we. This beer is influenced by both the Boston Lager and the Noble Pils. It is light amber to golden in color, with a fresh-almost spicy hop aroma, a crisp balanced flavor and a clean finish. Description: This Classic Enlgish Style Barley Wine is a strong ale, literally meaning wine from beer. It was once the strongest beer a brewer could make. This beer is big on malt, big on hops, and big on alcohol content. It can be enjoyed now and is also designed to age. Traditional Barley Wines are at their best between four months and six years. Ours is no exception. Description: We are honored to be approached by the Pittsburgh Brewing Company with a request for assistance in brewing a “Red” Ale – the color red being of the utmost importance… A super secret, we’ll have to kill you if you must know, grain bill was the answer. Deep red color, smooth and malty with a subtly sharp contrast to the inherent sweetness. Grains: Again…, we’d have to kill you. Description: Dark Angel is the dark version of the German Wheat Beers. It is unfiltered and deep amber to brown in color with the characteristic aromas of banana and fruit, clove and spice. Its body is light but its maltiness is quite complex. Light and dark, clean and complex, brewed for you by Helltown and All Saints, for Pittsburgh Craft Beer Week April 26-May 5 2014. This is a traditional West Coast IPA: Light color, medium body, and very thin on the malt character with a hop presence that will stick with you. Brewed with an abundance of fresh, locally grown Centennial, Nugget and Cascade hops. Description: E.S.B. is actually short for Extra Special Bitter, but don’t let the name fool you. This beer is all about the interplay of toasty malt sweetness and the unique characters of the East Kent Golding hop. This golden-amber ale has a delicately balanced aroma of malt sweetness and aromas of floral/honey/spice/with hints of lemon and lavender from the quintessential English hop: East Kent Goldings. This English Ale has a medium-full body, balanced flavor, and a smooth dry finish. Description: Delicate and balanced. This coffee beer offers a subtle coffee aroma and flavor with a medium-full body, with enough malt character to bring a smooth balance, and clean finish. You’ll need no creamer with this one! Description: We slow roasted over 200 pounds of locally grown pie pumpkins and added them into a variation of our Crimson Halo. This fall offering has a subtle hint of fresh spice, and a toasty malt character. The pumpkins lend this beer its color, and a nice smoothness on the palate. Description: A strong dark German wheat beer. This mediium-full bodied brew has the clove-like character of a light German Wheat beer (Hefeweizen), the maltiness of a dark German Wheat beer (Dunkelweizen)-a balance of soft bread-like and rich caramel toastiness with the richness and strength of a Bock beer. Bockbiers were brewed by monnks for fortification during times of fasting. This authentic German Wheat beer is light, crisp and refreshing with spicy notes of banana and clove. No spices or flavorings have been added, the unique flavor characteristics in this beer come from the fermentation process. Hefe Weizen means “unfiltered wheat beer” in German. Description: This authentic Vienna lager is rich and balanced with hints of toasted malt, and a crisp finish. Brewed in the 16th century at the end of the brewing season, and named for the month in which they were brewed. The Marzen is a hearty Oktoberfest. Description: Small beer, big stink. We wanted to produce a session beer that is extremely hop forward, relatively low alcohol, and very little lingering hop bitterness. We procured the most delicate, most thirst quenching malts to produce a very light, delicate, and refreshing beer. Featuring a crazy amount of hops with over a pound and a quarter in every keg. This is a full bodied, golden lager with an intense malt flavor and aroma. It has the strength of a traditional German Bockbier and enough hops to balance the extreme maltiness. This authentic English ale was exported to the Tsars of Russia in the 18th Century. 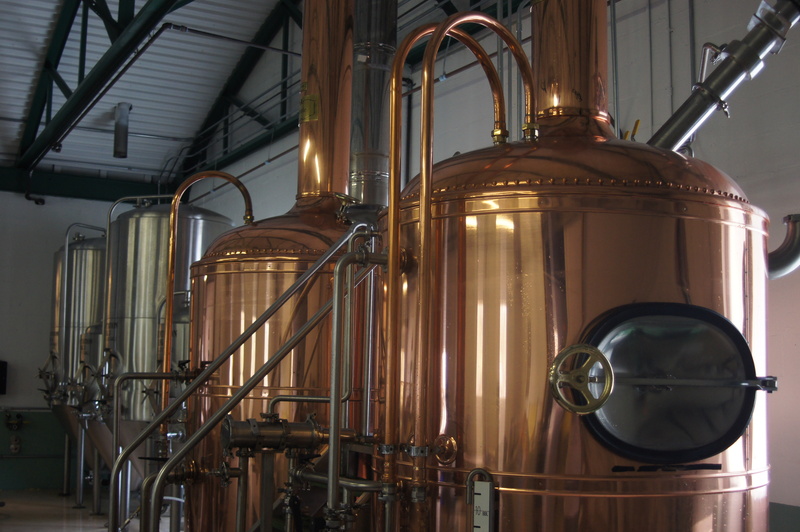 Its high alcohol content kept the beer from freezing during its trip across the Baltic Sea. This ale is smooth, rich and complex with true balance between the malt sweetness and roastiness and just enough hops to balance. This authentic German Festbier has the perfect balance of malt sweetness, hop bitterness, and toasted crispness. Light copper color, light body, with a clean, crisp finish. Brewed with 100 % German malt and hops. Description: Brewed to be light and refreshing while pushing the upper limits of alcohol content. This beer is very light in color and body, hints of fresh lime in the aroma, and a clean refreshing flavor. Description: Our most complex grain bill to date. Using over eight specialty malts, with each contributing to the color, flavor and aroma of this tantalizing brew. Our Redemption is medium bodied, deep copper in color, has a nice malty aroma, malty sweet start, dry nutty finish, and a subtle hint of chocolate. Intently brewed for purposed satisfaction. Delicate. Smooth. Refreshing. Angelic. Crisp. Balanced. Beer. Description: The deepest Amber, almost brown in color. Malty notes will tingle your nose . This full bodied ale is malty and smooth, with a slightly dry finish. By God it’s good. Description: Wheat malt makes a beer real thirst quenching and refreshing. This filtered ale has hints of apricot in the flavor and aroma, and made with nearly 50% wheat malt, it is nice and refreshing. This beer is light, crisp and easy to drink. Description: No apples were harmed in the making of this beer. We took a very light and delicate amber lager and added all natural organic flavors to provide a subtle hint of apple essence. You know us, beer first. In fact, with all the beer in the glass there wasn’t even room for the juice of two apples. Description: This fruit beer is fruit first. We crafted this beer using real blueberries. It has a subtle hint of the fruit in the aroma and flavor. This beer is light, crisp and refreshing, and quite effervescent. Description: Our Fruit beers are subtle. They are crafted to be beer first. St. Dora is no exception. We use wheat malt to give this beer its crispness, and just the right amount of flavoring at just the right time to lend a hint of cherry to this light and refreshing brew. Description: We crafted this ale to be light and refreshing with a bright gold color, and a completely balanced profile. Finishing on fresh oranges allow both the sweetness of the flesh and bitterness of the peel to add an equally balanced orange essence to this beer. Description: Wheat malt makes a beer real thirst quenching and refreshing. This filtered ale has hints of Orange in the flavor and aroma. We used real honest to gosh oranges in this one, not squeezed – to allow the beer to remain beer, but pick up as much orange as IT wants. It is nice and refreshing, this beer is light, crisp and easy to drink. Description: We crafted this lager to be light and refreshing with a very delicate malt profile, providing just enough body to lend a gentle sweetness balanced by a noticeable tartness. Brewed for you with real red raspberry puree. Description: Wheat malt makes a beer real thirst quenching and refreshing. This filtered ale has hints of Watermelon in the flavor and aroma, resultant of using 50 lbs of fresh watermelon in this brew. It is nice and refreshing, this beer is light, crisp and easy to drink… and NO SEEDS! Description: We crafted a robust Porter, which is very sharp and roasty, not too dry with just the right amount of hops to support the delicately sweet roasty malt character. This beer as a wonderful essence of coffee that brings pleasure even if you are not a coffee drinker. It is the perfect beer for your holiday celebrations. Description: This is a traditional West Coast IPA: Light color, medium body, enough malt character to support a hop presence that will stick with you. Brewed with an abundance of fresh, locally grown Cascade hops. Description: First brewed in the Czech Republic in 1842, this beer style is the most imitated in the world. Along with this beer’s brilliant clarity, light body, golden color, and crisp finish, it is the hops that make this beer what it is. Brewed with 100% Czech Saaz (pronounced “sotz”-please) using a hop schedule like we have never done before to produce, for you, a beer as true to the original as we could make it. -Cheers to you, craft beer drinker. This beer started with 275 pounds of locally grown, fresh roasted pie pumpkins that were carefully crafted into a Porter with just the right amount of spice added at just the right time. Almost 20 pounds of roasted pumpkin per keg lend this beer a smooth body that is not too dry, nor too roasty, but delicately balanced. “met sint-juttemis” is a Dutch saying meaning basically: when hell freezes over, or when pigs fly, or when pumpkins get put into a porter. Description: Originating in Plzen, now the Czech Republic, this light bodied, ruby-black beer has the smoothness of a lager with a clean roasted edge and complex malt character. In spite of its dark color, this beer is a soft and elegant brew that is rich, mild, and surprisingly balanced. Unlike a blonde Pils, the hop bitterness in this darker version is soft and subdued. Description: A beautiful dark caramel color with a bouquet of fruitiness and cloves, and hints of intoxicating warmth. Light bodied and well carbonated, allowing flavors of cranberry and orange to dance upon your palette leaving a crisp, malty finish with fruit and warming nuances. This Christmas Ale is fashioned after no other. – Cheers! Description: This ale has a beautiful deep dark brown color, a rich, creamy, silky smooth character, with a toasted malt aroma balanced by a slightly sweet, malty flavor. Oatmeal Stouts are in the family of sweet stouts that are less sweet, relying on oatmeal for body and complexity. While all stouts are born of porters, this stout has very little roasty, coffee like character. Named after St. Olaf “the stout”. Description: This authentic German Rye beer has a nice golden orange color, spicy black currant aroma, with subtle hints of clove and fruit. The rye malt lends a real smoothness to the palate. No spices were used in this beer. We used 55% barley malt, 45% rye malt and an authentic German ale yeast. A centuries old beer style. We took our regular Tim and got him all hopped up on a little over 20 pounds of locally grown performance enhancers, such as chinook, centennial, and cascade, in addition to his already massive hop features. He is much more striking in both aroma and flavor, and need we mention… body. Description: This American Pale Ale is made with 15% rye malt and an extraordinary amount of flavor and aroma hops. The rye malt provides a nice smoothness to the palate while the centennial hops will tickle your nose and dance ever so smoothly on your palate. Description: Only a very slight deviation from a true American Pale Ale, this beer was brewed to come in under 5% ABV. The addition of freshly picked cascade hops provide a real smooth hop character. 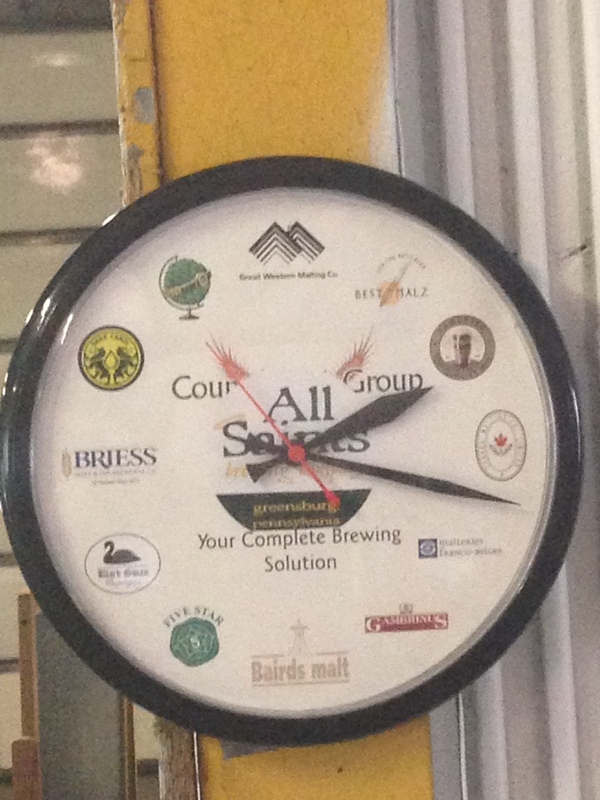 This lager is aged much longer than any of our traditional beers. The fermentation process and our rich black malt make this lager a Gold Medal award winner GABF 2002.